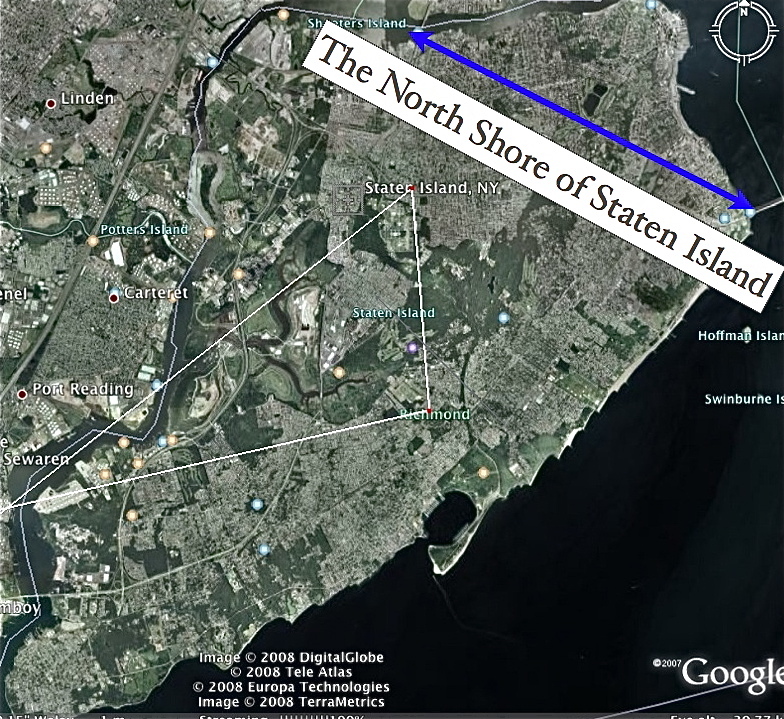 Just Where is the North Shore of Staten Island? The term North Shore is frequently applied to a series of neighborhoods within New York City’s borough of Staten Island, USA. Generally, the North Shore is deemed to consist of the communities located within ZIP Codes 10303, 10302 and 10310 in their entirety, along with all of the area covered by 10301 except Sunnyside, and those parts of 10304 and 10305 that lie north of the Staten Island Expressway. Under this definition,Mariners Harbor, Port Richmond, West Brighton, New Brighton, St. George,Tompkinsville, Stapleton, Clifton, and Rosebank, are included among the North Shore’s neighborhoods. The North Shore was the first section of Staten Island to become more or less densely populated, a condition that had been achieved by the beginning of the 20th Century. According to the most current U.S. Census data, the population in the neighborhoods typically lumped together as the North Shore is almost evenly split among Whites, African-Americans and Hispanics, which each group comprising slightly more than 30 per cent of the total. They are joined by recent immigrants from such countries as Sri Lanka, Albania, Trinidad, Liberia and the Philippines. Since the late 1990s, the North Shore has seen a large influx of Mexican immigration, many from Michoacan, and centered around Port Richmond and Tompkinsville. ] The area also continues to see a large number of Italian immigrants. The Kill Van Kull shoreline — stretching from St. George to Mariners Harbor — was once a major manufacturing hub, but today most of its factories are closed. The North Shore also suffered economic blows when the branch of the Staten Island Railway serving it ceased passenger service in 1953, and when the Staten Island Mall opened in 1973, attracting many businesses from Port Richmond, which heretofore had been a prominent commercial district. St. George is the county seat of Richmond County, as Staten Island is alternately known, and is the site of the passenger ferry connecting the island with downtown Manhattan. Important landmarks and points of interest located on the North Shore include Wagner College,Sailors Snug Harbor, the Bayonne Bridge, and Silver Lake Park and its public golf course. ~ by stufffromthelab on June 28, 2008.